Pull the seat belt tongue to the desired length. Insert it into the seat belt buckle until you hear a click sound. 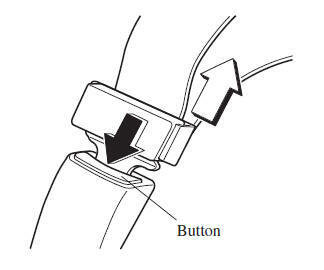 To lengthen the belt, hold the seat belt tongue at a right angle to the webbing and pull. To shorten, pull the loose end of the webbing. Make sure the lap belt is snugly fi tted against your body. Wearing the Lap Belt: A lap belt worn too high is dangerous. In a collision, this would concentrate the impact force directly on the abdominal area, causing serious injury. Wear the lap belt snugly and as low as possible. Depress the button on the seat belt buckle.